Oh yes, we’ve done tours. We’ve done distillery tours, lighthouse tours, colliery tours, castle tours, jail tours, old Edinburgh close tours, ghost tours, World War I trench tours and more; and we’ve done them self-guided, or with old-timers or temporary summer staff in charge, with professional actors, with students in costume and plain bored students, (aka bad actors). So, we think we know our tours. But we think the Glasgow Central Station Tour is the best tour we’ve ever done. Exactly why is another matter and, oddly, quite hard to define. Disappearing behind the scenes at Glasgow Central Station on our tour. Vaults, corridors, passageways...just as well the guide knows the way. It isn’t as if there isn’t anything else to do in Glasgow - after all, it’s got plenty for visitors and residents alike. 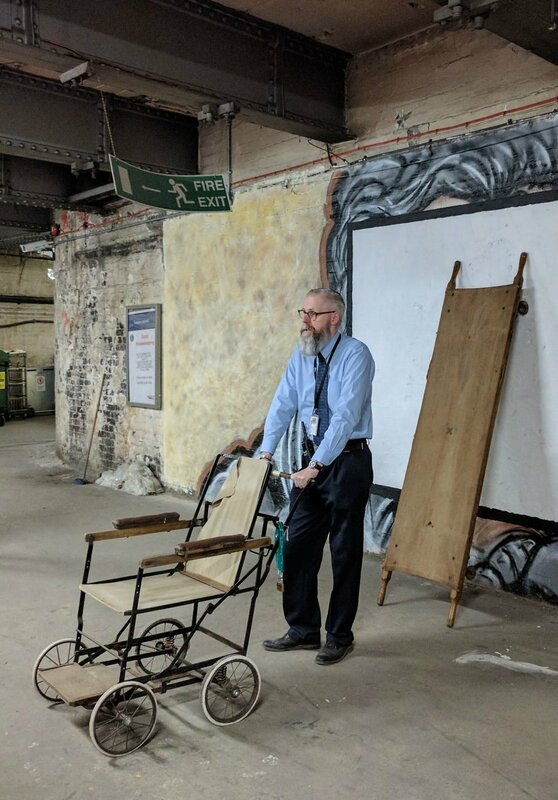 The tours came to pass through the determination of Network Rail employee Paul Lyons (who, at time of writing, takes the tours himself). He believed that Glasgow’s Central Station had a story that people would want to hear. And he’s been proved right. I have always thought that stations, especially station platforms, (like war-time aerodromes and runways), are places imbued with emotion and drama. There, on the platform edge, hands parted never to be clasped again - because of war, emigration or just life’s random circumstances. So, perhaps, stations are emotional places by their very nature. As for Glasgow Central, it is indeed, just that: central, and it’s been for long at the heart of the commercial and social life of a great European city, called the Second City of Empire in its industrial heyday. A World War I vintage wheelchair. Found in a store that had not been opened for years. Behind our guide, a stretcher of the same vintage. Before the decision not to repatriate bodies, the corpses of soldiers were taken home on these stretchers and left on the platform for relatives to identify. Mr Lyons has had great material to work with, as well as one other advantage. The independent railway companies, certainly including the Caledonian, whose station this was, all had endless transactions and documents to archive, as well as equipment and paraphernalia for goods and passengers. 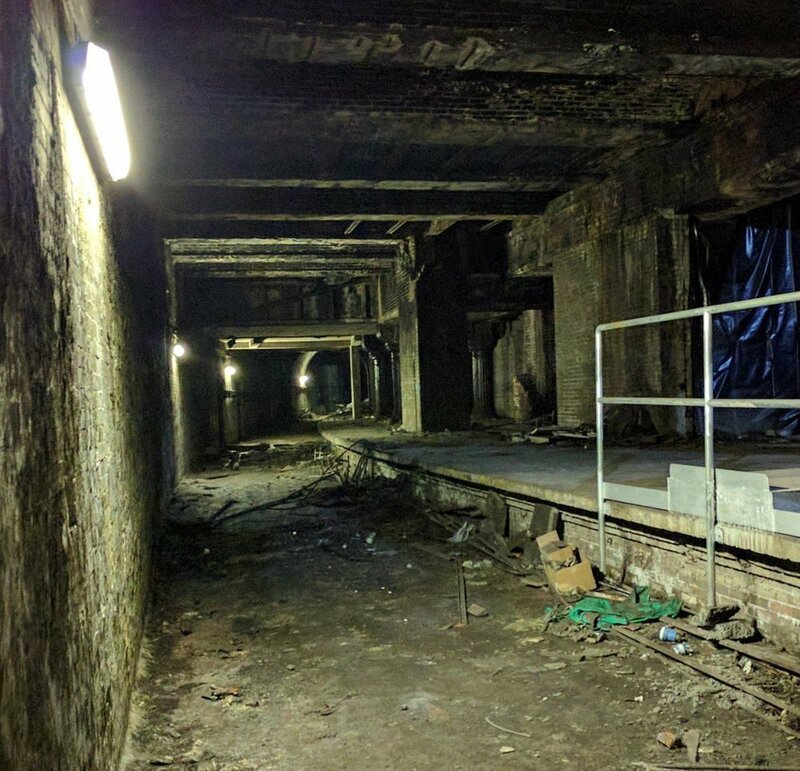 And it all ends up being stored somewhere...in vaults, in disused sections of tunnels perhaps, in rooms and stores that become all but forgotten about, especially as they lie below platform level - in another world. For our tour guide, it has been a series of re-discoveries. The site as a station goes back to 1879. As well as a throng of travellers, in former times all kinds of cargoes, notably coal and grain, came in ‘behind the scenes’. And an even larger network of suburban lines used the station, some at low level, below today’s concourse. Finally, of course, it’s a very large station, over two square miles. It’s a maze, down there...but the guide has been through it all, so you’re quite safe! You get the impression he has been engaged in a long process of releasing and recording the station stories before they were forgotten about. And what tales he tells...vivid, funny, dark, dramatic, poignant: perhaps even he doesn't know which one will pop into his head next. They seem to be prompted almost by where he stands with his obedient followers. One minute it’s in a long corridor - look, that’s where they tied the horses - further on, it’s in a poky room that smells of...what? The river probably...it’s where they kept the record books but no-one would go in because of the size of the rats… What??? It’s all right now, there’s been none spotted for, oh, a fortnight. Maybe he is kidding us. You never know what he’s going to say next. His sense of comic timing is up there with Billy Connolly. Yet it can be dark. Takes you by surprise. Suddenly, he talks of trains coming in and hundreds of candles are lit. No, it’s nothing religious. The candles are held by women waiting for their menfolk, who have just returned from the horrors of the trenches of World War I. Run a candle along the seam of the battledress and it kills some of the lice...The men were the lucky ones of course. They got home. Victorian cast iron columns still in good condition. He wants a statue, a memorial to the women of Glasgow. He has plans for a steam locomotive and a carriage, down in the dark vault of the unused and soot-blackened low level platform. He would like a museum, and some help with the tours. Perhaps what makes the excursion unforgettable is that nothing has been really sanitised - the surroundings - girders, passageways, iron columns and everything else are the real deal, cobwebs and all. That’s what makes it an adventure for the participants. And, more importantly, nothing has had to be invented. Sure, he’s had ghost hunters down there - but who needs that nonsense (oh, the overrated Mary King’s Close in Edinburgh, probably) when there are so many fascinating tales, a ton of authentic ambience and a real sense of being somewhere so different from run-of-the-mill Scottish tour venues. Small wonder it’s rated on TripAdvisor as the No 1 Glasgow tour. There's a good selection of Glasgow guidebooks on this Amazon link as well, if you want to find out more before your next visit to Scotland's largest city. Imagine this platform in the days of steam. Small wonder it had a terrible reputation! A train came in, filled the area with smoke, while a Glasgow ne-er-do-well ran out from behind a pillar, cut off a lady's handbag and disappeared all in a few seconds!